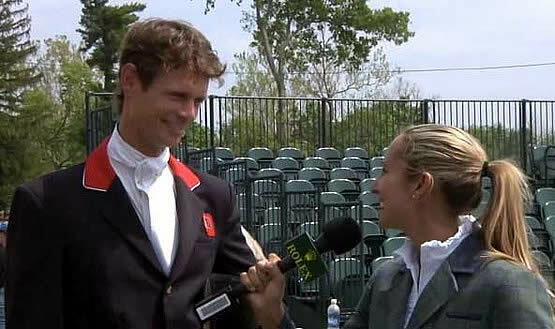 Fox-Pitt, 43, has now won two consecutive legs of the $350,000 Rolex Grand Slam. He won the Land Rover Burghley Three-Day Event (England) last September, and if he wins the Badminton Three-Day Event (England) next week, he’ll become only the second rider to win Rolex Grand Slam. (Pippa Funnell won the Rolex Grand Slam in 2003.) Fox-Pitt’s victory also extended his lead in the HSBC FEI Classics Series. “This is the closest I’ve ever gotten to winning the Rolex Grand Slam. I’ve never managed to win two four-stars in a row, and this is wonderful, but to win three in a row is fairly unlikely,” said Fox-Pitt. He added, “It was a serious show jumping track, and I’m just very lucky that Allison took that long route at the third-last fence yesterday.” On Saturday’s Cross-Country course, Springer chose to jump the slow option on fence 27, which caused her to finish 8 seconds over the optimum time and add 3.2 time faults to her first-placed Dressage score. Click here to watch an exclusive interview with William! Allison Springer of the United States, on Arthur, held on for second (47.0) and earned $37,000, and Boyd Martin of the United States, on Otis Barbotiere, moved up to third place (51.0) to earn $30,000. Martin also finished eighth on Remington XXV (56.9). By winning the Rolex USET Four-Star Championship as the top-placed U.S. rider, Springer, 37, also won a special prize — an 18-month lease of a 2012 Range Rover HSE courtesy of Land Rover North America. Springer test-drove the car on a lap around the Rolex Stadium during the awards ceremony. “It’s a good thing they kept someone in the car with me, or I’d have been out there doing donuts!” she said with a smile. Click here to watch an exclusive interview with Allison Springer! Keep up to date with Rolex Kentucky and Ariat Kentucky Reining! Follow us on Facebook and Twitter to get the latest info on the 2013 Rolex Kentucky and Ariat Kentucky Reining Cup! Did you miss the live NBC Broadcast, and couldn’t make it to the event? Did you have so much fun watching William Fox-Pitt ride to victory this year that you want to check it out all over again? Don’t worry; you can purchase the 2012 Event DVD today! The highlight DVD for Rolex Kentucky is only $34.95; get yours today! Click here for more information about pre-ordering your DVDs!